Moses Rodriguez is a nationally recognized multiple sclerosis expert. He holds the academic rank of Professor of Neurology and Immunology and the Mildred A. and Henry Uihlein II Professorship in Medical Research at Mayo Clinic College of Medicine. 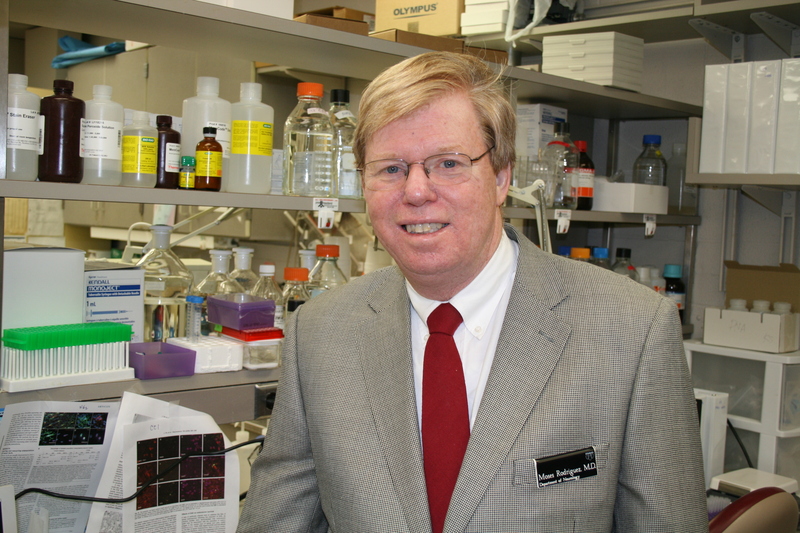 He recently received the highest award at Mayo Clinic – the Distinguished Investigator Award.Dr. Rodriguez earned his B.A. and M.D. degrees at Northwestern University. After residency in neurology at Mayo Graduate School of Medicine, he served as a trainee at the National Institutes of Health and completed fellowships in neuropathology at the University of California, San Diego, and at Scripps Research Institute.Dr. Rodriguez is co-director of Trombones Anonymous, a regional trombone choir for which he has written over 250 original arrangements. He enjoys bass fishing and camping with his family in the Boundary Waters Canoe Area in Northern Minnesota.